You will not regret using Belgard products on your next hardscaping project. 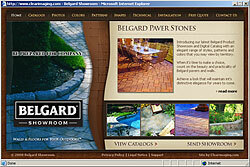 Belgard is well-known in the construction and landscaping industries for its top-notch hardscape products. It uses the finest raw materials and uses the latest technology in manufacturing each hardscape product that it offers. Moreover, it has products for all kinds of hardscape features and amenities such as patios, driveways, walkways, fire features, seating areas, retaining walls, and outdoor living amenities. Whether you are a homeowner working on a DIY outdoor improvement project or a contractor handling a large commercial landscaping project, you will always find the right Belgard product that will suit your requirements. Introducing our latest Belgard Product Showroom and Digital Catalog with an elegant range of styles, patterns and colors that you may view by territory. When it's time to make a choice, count on the beauty and practicality of Belgard pavers and walls. Achieve a look that will maintain int's distinctive elegance for years to come.